Chicory is an herb familiarly linked to Mediterranean cooking, but it also has a long history of medicinal and other uses. 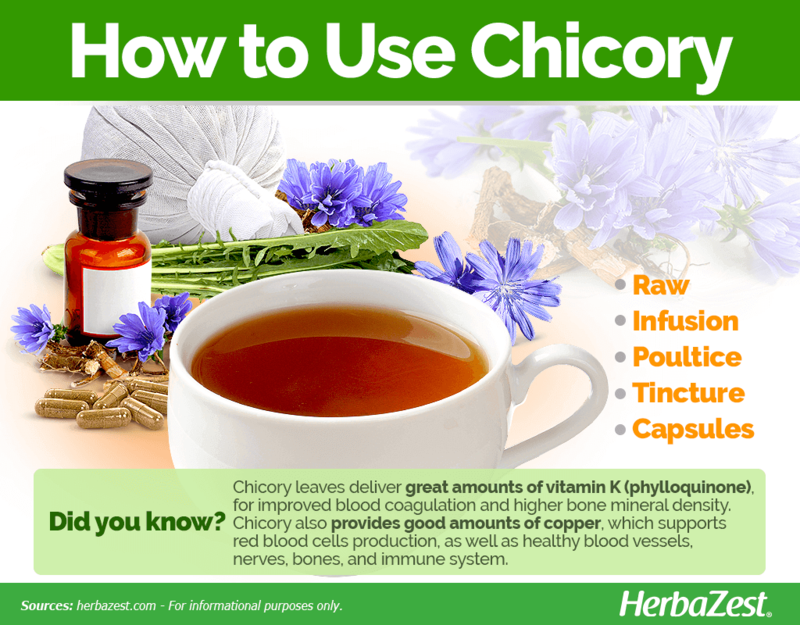 Learn more about chicory's surprising benefits. Best-known as a pleasantly bitter complement to Mediterranean cuisine, chicory has proved over the years to be much more versatile, ranging from a creative substitute for wartime shortages to a medicinal herb. The herb traces its origins, however, to the Mediterranean region. The date of its first appearance remains unknown, though documentation of its human uses dates as far back as 4000 BCE in Ancient Egypt, where it was mentioned in the Ebers Papyrus. Preventing liver damage. Its antioxidant properties work to prevent liver damage within the system. Enhancing digestive function. 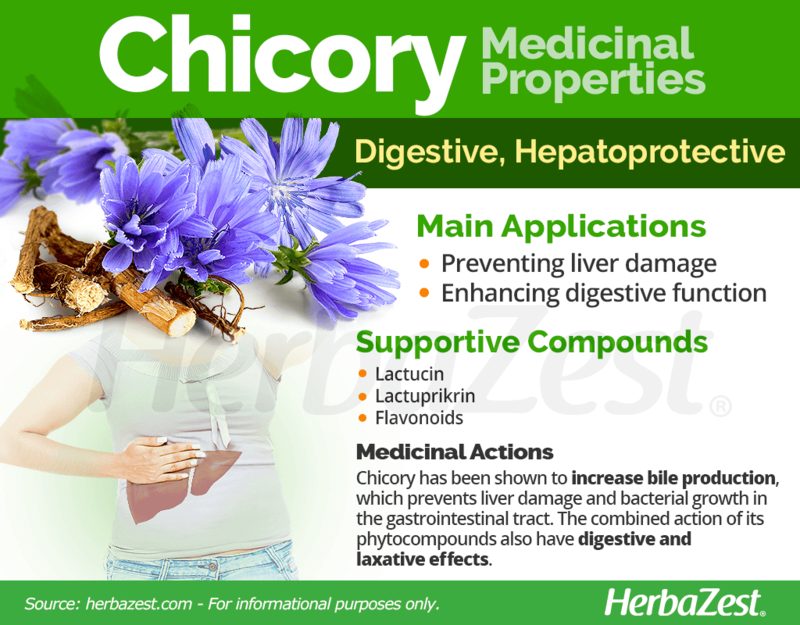 Chicory may stimulate the production of bile, which impacts the overall digestive system. Preventing parasites. Chicory's anthelminthic properties can inhibit the reproduction and growth of certain parasites, such as intestinal worms. Preventing bacterial infections. Because of its antibacterial properties, chicory can prevent sinus infections, as well as other bacterial infections. Preventing fungal growth. Chicory can prevent fungal growth on the skin or within the body. 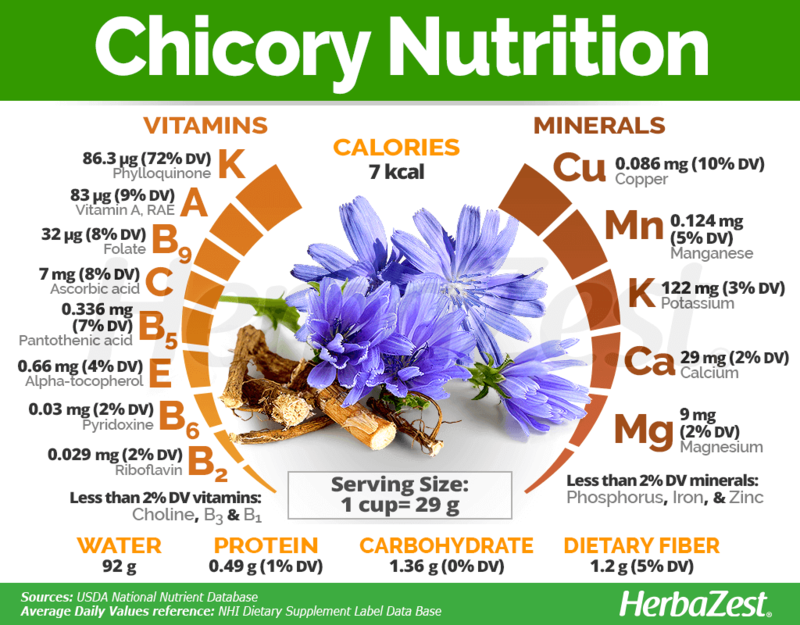 Chicory is a fount of healthy nutrients, especially beloved by dieters for its low calorie count. Lactucin and lactuprikrin are the two compounds responsible for most of its medicinal uses. Chicory has numerous antioxidant properties, including flavonoids, which can inhibit many harmful actions against the body. The natural root and root callus extracts of chicory have shown important hepatoprotective effects, increasing bile production, which prevents liver damage and bacterial growth in the digestive system. The medicinal properties of chicory have been evident since ancient times, despite the lack of widespread use of the plant in such a sense today. All parts of the plant contain volatile oils that act as a digestive tonic, primarily as a laxative, and to inhibit the reproduction of intestinal worms. German folk medicine has also applied the flower to treating gallstones and sinus infections. Preliminary research suggests that the herb's inulin content can act as an appetite suppressant or an alternative to sucrose for diabetics. Boldo and dandelion also possess hepatoprotective properties, whereas cardamom and oregano help digestion. Chicory is safe for most people when taken medicinally or consumed. It is also likely safe when applied topically. However, it can cause minor skin irritation for some individuals. Chicory may cause allergic reactions. Those who are allergic to ragweed or related plants may get an allergic reaction to chicory, so limiting usage of chicory is recommended for allergy sufferers. 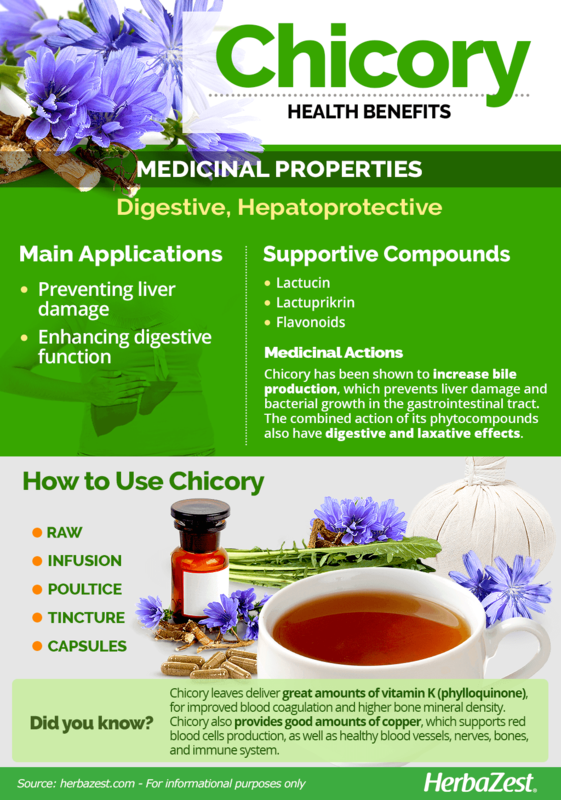 Chicory can trigger the production of bile, so those who suffer from gallstones should not use chicory. Women who are pregnant or breastfeeding should consult a physician before using chicory medicinally. Chicory leaves are an excellent source of vitamin K (phylloquinone), which not only aids blood coagulation but also have been linked with higher bone mineral density and a reduced risk of lower hip fractures. Chicory also provides good amounts of copper, a mineral that works with iron to support red blood cells production, and also promotes the health of blood vessels, nerves, bones, and the immune system. Other important vitamins and minerals, such as manganese, vitamin A (as beta-carotene), vitamin C (ascorbic acid), vitamin B5 (pantothenic acid), and vitamin B9 (folate) are also present in adequate amounts in chicory. Additionally, the nutritional value of chicory leaves is rounded by small quantities of vitamins E (alpha-tocopherol), B2 (riboflavin), and B6 (pyridoxine), along with minerals such as potassium, magnesium, and calcium. A cup of chicory greens (29 g) provides 7 calories and 5% of the daily value for dietary fiber. While it is often used in culinary dishes, the most effective way of obtaining chicory's health benefits is in medicinal forms of consumption, where the properties are more concentrated. Raw. When consumed orally, mostly in salads, chicory can aid digestive functions. Infusion. When brewed into a hot tea, chicory infusions can help prevent liver damage and fight sinus infections. Poultice. When applied topically, the raw and crushed leaves of chicory can help treat and prevent fungal growth on the skin. Tincture. The leaves and root of chicory can be macerated in alcohol to extract the antioxidant properties of the plant. 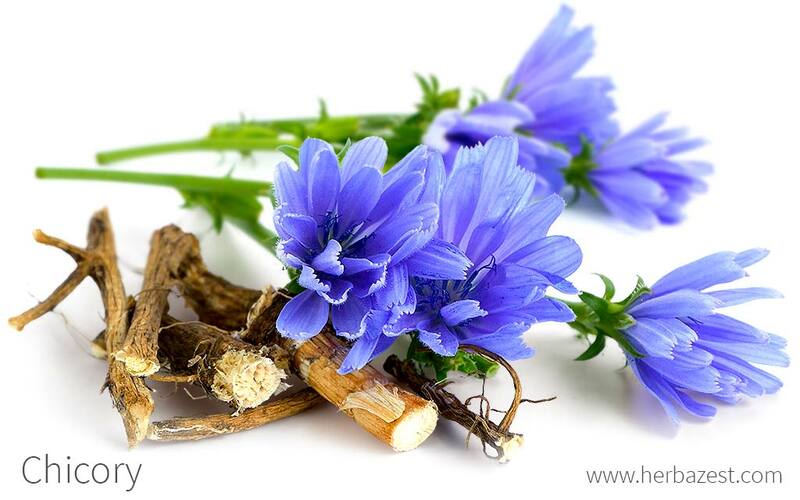 Whe diluted in water, chicory tincture can help prevent liver damage. Capsules. In supplemental form, chicory's inulin often decreases constipation due to its laxative properties. Chicory leaves can sometimes be found year-round at supermarkets that carry imports, but fresh leaves are easiest to find from midsummer to late autumn in grocery stores and farmers' markets. The latter often also carries fresh root at similar times, and premade "coffee" grounds are available at many specialized health stores. As an herbal remedy, mainly tincture, and as a supplement, in capsule form, chicory is still in the process of gaining a following, but it can be found via online retailers. As the dietary and medicinal benefits of the herb become more prominent, increased availability of supplements will surely follow. Because chicory is hearty and grows naturally in the wild, very little care is needed to cultivate a healthy crop for this perennial herb. Regular watering and fertilization are helpful, but they are not required, as long as the soil is of good quality. Follow the growing guidelines below for additional growing tips. Chicory can grow either in full sun or partial shade. This hardy herb does best in cool, temperate climates, but can survive in diverse conditions. Temperatures from 45 - 75°F (7 - 24°C) are acceptable, and seeds can be sown as early as two to three weeks before the last frost of spring. Roots should be harvested first and later replanted to produce edible leaves. Chicory is vulnerable to deer, so keeping them out is vital. Chicory, known scientifically as Chichorium intybus, grows from 1 to 4 feet (30 - 130 cm) tall and has distinctive bluish-purple blooms though in rare cases these can appear white or pink. The flowers are singularly arranged along the length of its rigid, dark-green stem. Chicory has two different types of leaves: large-dandelion-shaped leaves near the base of the stem and small lanceolate-to-oblong-shaped leaves along the length of the stem. Chicory (Cichorium intybus) shares the star-like shape of its flowers with more than 23,000 species that also belong to the Asteraceae family, such as chamomile (Matricaria chamomilla), dandelion (Taraxacum officinale), and milk thistle (Silybum marianum). The genus Chicorium is made up of ten different species spread out across Europe and Asia; however, the three most popular varieties include endive (Chichorium endivia), wild endive (Chichorium pumilum), and of course chicory (Chichorium intybus). Chichorium endivia, better known as endive, is a commonly used leaf vegetable that is used for culinary purposes and often confused with chicory. There are two different varieties of endive: Curly endive (crispum), which has narrow, green, curly outer leaves, and escarole (latifolia), with broad, pale leaves. Wild endive (Chichorium pumilum) is similar in appearance to chicory, but the flowers are a paler blue than the chicory variety. First cultivated as an herbal medicine in ancient Egypt, chicory was a digestive aid in classical civilizations for thousands of years, later finding application in Greece and Rome as food, usually in salads. The herb remained in favor up through medieval times, popularly grown in monasteries. In the 1600s, the Dutch discovered the capacity of chicory to be ground into a coffee-like powder, and this cheaper alternative was used to supplement wartime scarcity and blockades, notably in Prussian conflicts and during the American Civil War. In the United States, there is a longstanding history of replacing coffee with chicory in prisons, since it was much cheaper. All parts of the chicory plant are used to human benefit, and this versatility has led it to become an important crop particularly in the European large-scale agricultural industry. Belgium and the Netherlands combined to produce 77% of the world's supply in 2011 with a yield of over 67,000 tons. France and Poland also have thriving markets, selling both leaves and roots for food and fodder as well as herbal medicine. Livestock feed. Chicory can be used in livestock fodder as a substitute for oats. Much of the production of the plant that goes toward this end takes place in New Zealand. Gardening. It is also a popular ornamental plant in gardens that provide a temperate environment, widely regarded as aesthetically pleasing for the color of its flowers.